Split-level housing became popular in the 1960s, as it provided a way to separate family activities. However, with split-level homes came split entries. In this style of home, the front door leads to a small foyer halfway between the upper and lower floors. Stairs immediately ascend and descend from the entryway, creating a lack of storage room. But, with any home, there are ways to add storage to even the smallest of spaces. These gorgeous split-entry foyers are sure to inspire your next project. By nature, split-entry foyers are small. And, they can be really tight – especially because the door needs space to open. This can make it difficult to find a place to store shoes, in particular. This DIY project by Lemon Thistle solved the shoe storage dilemma by adding built-ins to both sides of the entryway. The drawers glide out to accommodate shoes and feature modern drawer pulls. But, when the drawers are closed, they sit flush against the wall. Thus, giving you plenty of storage without taking up valuable floor space. Split-entry foyers can look dated. And, that’s usually because they haven’t been updated since the day they were built. 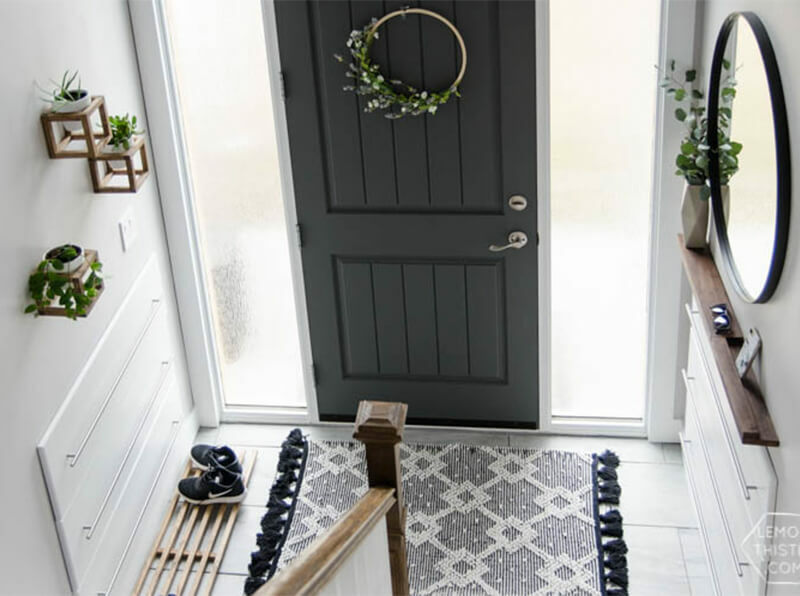 But, with a few simple upgrades, like a new door, custom millwork and a fresh coat of paint, you can transform your entryway from unsightly to inviting. In this front stairway project, Keep Home Simple removed outdated carpet and tile and replaced it with modern espresso wood flooring. And, with the addition of a railing and painting the door and window trim a bright shade of white, the stairwell opens up. Not to mention, the installation of wainscoting and shiplap brings more visual intrigue to the space. Finally, a wall-mounted coat rack provides room to hang jackets, scarves, and keys. Oftentimes, split-entry foyers can feel cut off from the rest of the home. But, fortunately, a simple remodel can tie the upper and lower floors of your home together while bringing in much-needed natural light. 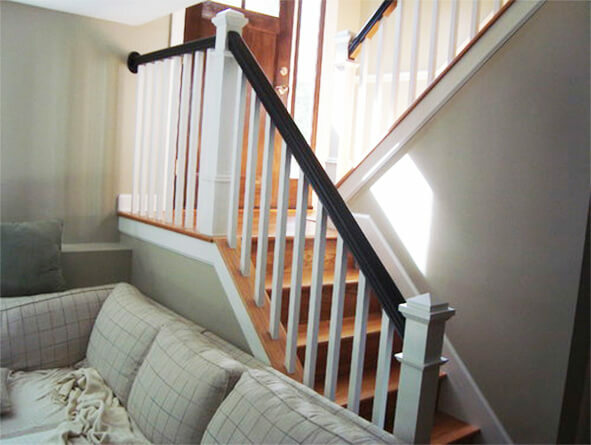 In this split-foyer home remodel, the designer opened up the stairwell by removing the half wall and replacing it with railings. Now, guests entering the home will get a clear view of the kitchen. Moreover, the railings also let more natural light in to make the foyer appear less dark. Finally, the transitional-style railings feature white and warm brown paint. Thus, tying in the colors of the kitchen cabinets and front door for a consistent look. Are you tired of having limited storage and style in your split-entry foyer? Friel Lumber has the materials you need to make over your entryway. Stop by today at 100 Friel Place in Queenstown, MD to browse our selection. Or, call us at 410-827-8811 for pricing information and advice.